Pathways to Progress for the Women and Girls of Western New York is a groundbreaking effort toward meaningful, measurable differences in the status of women and girls in the region. An initiative of the WNY Women’s Fund that was developed and produced by the UB Regional Institute, Pathways to Progress is the first region-wide assessment on the status of women and girls, and a baseline for moving forward. The effort also serves as a guide for measurable progress by identifying leverage points for impactful investment and action. The effort’s final report is the result of an 18-month research effort involving extensive data analysis and the engagement of diverse community perspectives, including more than 300 women and girls, service providers, advocates, funders and regional leaders. 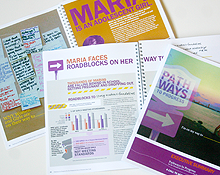 Pathways to Progress explores five key populations in need – adolescent girls, single mothers in poverty, victims of intimate partner violence, women on leadership paths and senior women. The final report was publicly unveiled on January, 14, 2010. The WNY Women’s Fund will play a key role in building community awareness of the report’s findings, provoking an ongoing, region-wide dialogue on women and girls, serving as a knowledge hub on all issues affecting women and girls, and advocating and investing in key areas. Additional support for Pathways to Progress was provided by the Community Health Foundation of Western & Central New York, the Joy Family Foundation, the Robert J. and Martha B. Fierle Foundation, the James H. Cummings Foundation, Inc., The John R. Oishei Foundation, the Patrick P. Lee Foundation, Delaware North Companies and the Community Foundation for Greater Buffalo.